BacPac grew out of requests from FCX customers for a product that would combine the compression speed and effectiveness of FCX with the functionality of a true backup program, including image mode backups and tape handling. The combination of compression, efficient I/O, and backup processing resulted in much smaller savesets, and the smaller savesets reduced the amount of tape or disk space needed to hold the savesets. In most cases, the smaller savesets also reduced the amount of time needed to write the savesets to tape or disk, so a double improvement was realized. The savesets produced by BacPac are called pacsets. The smaller pacsets also made it practical to perform remote backups over a network, so a client/server architecture was added. Command Line Syntax The BacPac command line syntax is similar to the OpenVMS Backup utility syntax, and most of the Backup command qualifiers also work with BacPac. There are some additional qualifiers which are unique to BacPac and which allow you to do special things like specify compression features, broadcast a message to all users when a backup starts, or notify a user by email when a backup is completed. Tape Backups On the faster VAX and Alpha computers BacPac can often achieve smaller elapsed backup times even if the tape drives are fast and have built-in data compression. This is because BacPac can achieve better compression using resources in the host computer, and much less data is transferred over the tape drive interface. 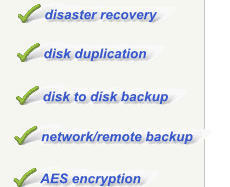 Disk Backups Many customers use BacPac to perform fast disk-to-disk backups of large databases or user disks. These backups take much less time than a backup to tape, and BacPac does them up to ten times faster than the Backup utility. Plus, the BacPac pacsets are usually less than half the size of a Backup saveset. Remote Backups In the BacPac client/server architecture the backup command can be entered at either the local or the remote computer. The computer at which the BacPac command is entered becomes the client and the other computer becomes the server. Compression is performed in the computer which is “closest” to the disks which are being backed up, so that compressed data is sent over the network. Remote backups can be disk-to-disk or disk-to-tape. Using BacPac with Backup Although many customers use BacPac in place of the Backup utility, some customers have found that the best solution to their backup problems is a combination of BacPac and Backup. BacPac is used to perform fast disk-to-disk backups to minimize downtime for critical files like databases, then Backup is used to do image backups of the disks to tape. And BacPac is used to do any remote backups because the Backup utility does not have this capability. .